GitHub - freaktechnik/twitch-chatlog: Fetch the chatlog to a twitch VOD from your command line. Want to be notified of new releases in freaktechnik/twitch-chatlog? 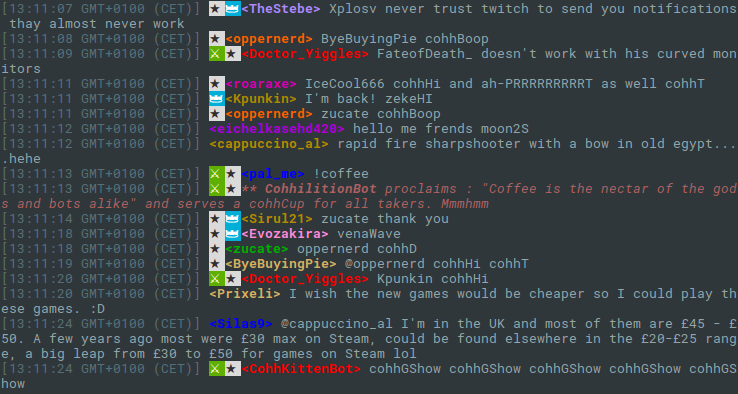 Fetch the chatlog to a Twitch VOD from your command line with twitch-chatlog. This little command can download the whole chat log to a twitch VOD. It takes the ID of the VOD (1111111 or similar) as only argument. To learn about the usage of the command, use twitch-chatlog -h.
The output can optionally be colored with -c or --color or by setting an environment variable TWITCH_CHATLOG_COLOR. To disable the loading progress bar, set --no-progress or TWITCH_CHATLOG_PROGRESS to false. To make use of your own Twitch application client ID, you may provide it as a command line option -C or --client-id or set an environment variable TWITCH_CHATLOG_CLIENT_ID. The default value for client ID is not guaranteed to work past 08 Aug 2016, in which case you will have to supply your own. To control the part of the chat log to fetch, --start, --length and --end can be used. See the usage section below. By default the command will only fetch the first ten minutes of chat log to minimize the amount of requests. Fetch the chat log to a Twitch VOD. vod_id is the ID from the VOD URL, optionally prefixed with v (deprecated). -r, --raw        Print the raw JSON output instead of a formatted chat log. for the VOD and colorize the output. --end=2016-07-20T20:37:44+0000            date and don't show a progress bar. This program uses an unofficial Twitch API that may stop working at any point. It also potentially sends a lot of requests in quick succession, which might lead to Twitch taking measures against it and thus the program and/or your Twitch experience being reduced.